Today marks the start of a two-game stretch that could define the season for the Cleveland Browns. First up are the Atlanta Falcons, who despite being just 4-6 currently sit in first place in the NFC South Division thanks to their 4-0 record within the division. (Ironically, the Browns are in last place in the AFC North Division with a 6-4 record. Go figure). After the Falcons, the Browns will travel … somewhere … to take on the Buffalo Bills. If the Browns play well, the games against the Falcons and the Bills are winnable ones. Take care of business these next two games, and the Browns will enter the final quarter of the season at 8-4 and carrying a real shot at 10 wins and a potential playoff position. But play like they did last week against Houston and the final month of the season takes on a decidedly different turn. Lose to the Falcons and Bills and suddenly the promise of a 6-3 start to the season is lost as there is no way the Browns get from 6-6 to 10 wins. A 6-6 record and accompanying three-game losing streak also means the team will have to take a hard look at sitting quarterback Brian Hoyer in favor of getting rookie Johnny Manziel actual playing time over the season’s final four games. While winnable, it may be too much to ask this Browns team to beat both the Falcons and Bills. If they pull off that feat, it would give the Browns a three-game road winning streak, which may not sound like much on the surface, but would be a fair accomplishment for a franchise that has not won consecutive road games since 2008. The task won’t be made any easier as the defense continues to lose key players on what seems like a weekly basis. While neither has been officially ruled out for today’s game, it seems unlikely that linebackers Karlos Dansby (listed as doubtful) and Jabaal Sheard (questionable) will be able to play today. But this Browns team has been full of surprises this season as they try to shake off the cloak of being “the same old Browns.” They responded to the disappointing loss to Jacksonville with a three-game winning streak and, even with last week’s loss to the Texans, have won five of their past seven games. Josh Gordon’s return can only help as he gives Hoyer and the offense a player that opposing defenses have to account for on every snap. With Gordon on the field, Andrew Hawkins is no longer going up against the opponent’s top cornerback, and running backs Isaiah Crowell and Terrance West will not be facing a crowded line of scrimmage. 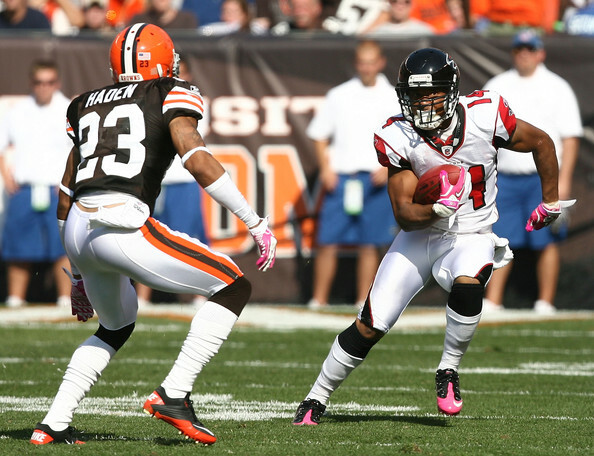 The Browns are already 2-0 against the NFC South this year and in six previous trips to Atlanta have won five times. On the flip side, the Falcons have lost seven consecutive non-division games. We’ve given up on trying to figure out this Browns team as every time we’re sure we have the answers, they change the questions on us. Today’s game does present opportunities, though. The Falcons are last in the league overall in defense, last against the pass and 24th against the run, so there should be plays to be made if the Browns want to reach out and take them. So while we may not be sure what is going to happen today at the Georgia Dome, there is one thing we are certain of. In this season of surprises, we’re positive the Browns still have a few ones left in them.